At this week's Macworld Expo, long-time Mac software developer Ambrosia Software released iToner 2, a new version of its iPhone ringtone-making utility. The company also announced an update to its audio editing software WireTap Studio and showed off Multiwinia, a new game in development, and Soundboard, an audio triggered application. 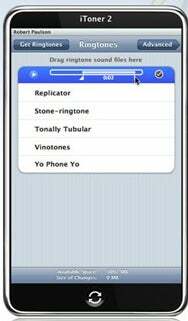 iToner helps Mac users make custom ringtones for their iPhones, without needing to pay a per-ringtone fee. The 2.0.1 software release builds on its predecessor by providing new features including ClearTone technology, new editing tools, and additional custom ringtones. ClearTone helps normalize and optimize audio to match the iPhone's speaker. New editing tools help you crop your audio sample for an iPhone ringtone; sliders let you scrub to the section you want. And iToner 2 includes more than exclusive 40 professionally-made ringtones. iToner 2 is a free update for registered users and it costs $15 to purchase. System requirements call for OS X 10.4.10 or later. WireTap Studio lets you record audio from any application, a microphone, the Mac's line-in port, or through audio input hardware. It features lossless audio editing—you can make changes, apply filters, and adjust encoding without touching your original, pristine audio file. The new WireTap Studio update improves memory usage and performance. Custom hot keys now let you start and stop recording, and option-clicking source pop-ups now show hidden apps. You can record from Java apps and other applications with improperly-encoded bundle identifiers, and the Multi-Touch trackpad found on new MacBooks and MacBook Pros is now supported, and scroll-wheels are as well. Finally, it features enhanced drag and drop capabilities. WireTap Studio 1.0.7 is a free update for registered users; the software costs $69. System requirements call for OS X 10.4 or later. Currently in development is Multiwinia, a new game coming to the Mac that was originally developed by Introversion for the PC. A sequel of sorts to Darwinia, Multiwinia is a multiplayer game set in a virtual world, where the denizens—Darwinians—compete (through you) in games of online slaughter. The game features six different modes and more than 40 maps. Ambrosia hasn't announced pricing or availability. Also in development is a new application called Soundboard. As the name implies, the app replicates the operation of a soundboard, a device audio engineers use to play short sound clips and audio files. Soundboard enables users to play and edit sound files using drag and drop, activating them by pressing the corresponding key on the Mac keyboard. Soundboard can also be tied into a MIDI or USB devices so you can trigger sound effects using an audio keyboard, for example. Ambrosia hasn't announced pricing or availability. Dale Roe contributed to this story.